Although some of us recognize that weight is about more than how much you eat or how often you move, this remains a dominant theme throughout much of our daily lives. We make assumptions that with the “right diet”, a “gruelling exercise program”, and “willpower”, anyone can lose and maintain weight loss. But it is not that simple! Weight is an incredibly complex phenomenon, influenced by many factors that are often out of our control. 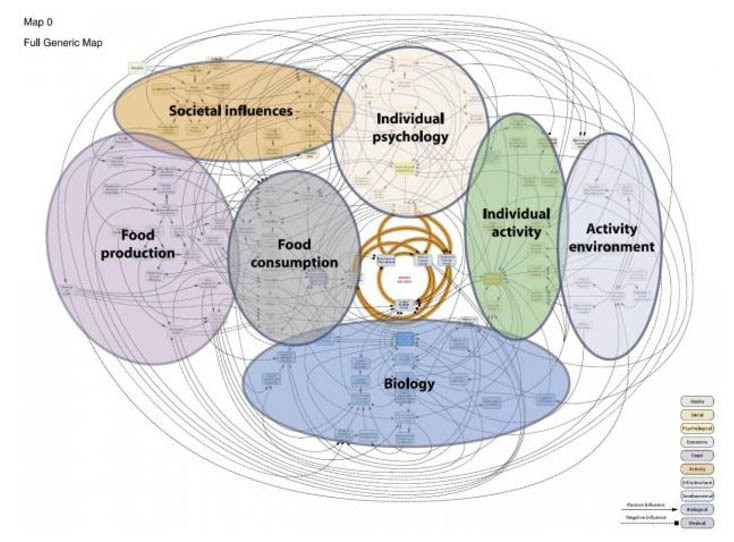 Check out the image below – in 2007, a team of researchers mapped out the dozens of contributors to weight and the complex interconnections among them (1). Since then, physicians, researchers, and policymakers have increasingly turned to systems science to help address the complexity underlying weight, and more specifically, obesity. You might be asking yourself, what is systems science? How can I use it? I’m just a student or practitioner or regular non-scientific person – what does it matter? Systems science may revolve around complexity, but it can be fairly simple to gain a surface-level knowledge of why it is important to apply to obesity. A system is an interconnected set of parts that are dynamic, always changing, and together, create a complex whole (2). Another term we may use to capture more complex systems is wicked problems, which includes issues that are nearly impossible to resolve because of the complicated system underlying them (think of climate change or poverty). Systems thinking, through which we can recognize that complex problems must have complex solutions. We can incorporate systems thinking into our everyday lives by resisting the urge to oversimplify things and looking at them through multiple perspectives. This requires us to work with others who hold different perspectives, knowledge, and skills that can help us better understand the complexity driving wicked problems (3). Systems modelling, which includes different complex, computational models that can help us understand, and even predict (!) the behaviour of a system (4). Systems science is incredibly important in helping us understand the complexity underlying obesity. Using a systems perspective can help physicians recognize the multitude of factors that contribute to their patient’s weight gain, researchers acknowledge that many factors outside of an individual’s “choices” influence their behaviour, and policymakers identify how to best promote health and wellness without unintentionally doing more harm than good. Most importantly (in my humble opinion! ), using a complex systems perspective can help everyone recognize that obesity is not simple, and that weight cannot simply be changed with the “right diet”, a “gruelling exercise program”, and more “willpower”. The idea that weight change is simple and within an individual’s control is the central idea underlying weight bias, which has negative health consequences for people’s mental, social, and physical wellbeing (5). Obesity is so much more than calories in and calories out – it’s complicated! Image credit: Tackling Obesities: Future Choices Project Report. 2007. Available from: https://www.gov.uk/government/publications/reducing-obesity-future-choices. Meadows D. Thinking in Systems: A Primer. Vermont, US: Chelsea Green Publishing; 2008. Green LW. Public health asks of systems science: To advance our evidence-based practice, can you help us get more practice-based evidence? Am J Public Health. 2006;96(3):406-409. Lee BY, Bartsch SM, Mui Y, Haidari LA, Spiker ML, Gittelsohn J. A systems approach to obesity. Nutr Rev. 2017;75:94-106. Brownell KD, Puhl RM, Schwartz MB, Rudd L. Weight Bias: Nature, Consequences, and Remedies. New York: Guilford Press; 2005.